Fixes to Rockstar Creator ahead of August 2 release of Stunt Props. Rockstar has published the official patch notes for GTA Online’s Cunnint Stunts update, which went live earlier today. The notes detail the main changes we already know about – 13 new vehicles, 16 stunt races, 180 clothes, 50 tattoos and a few other changes. It also fixes a lot of issues with the Rockstar Creator – no doubt in time for the August 2 release of new Stunt Props to players. There’s also a lot of bug fixes for recently introduced Adversary modes and the Further Adventures in Finance and Felony CEO update. The most interesting, previously unadvertised changes, come to the personal interaction menu. Style and Vehicle sub menus have been added and Racing Outfit and Bike Helmet options have been added so players can specify a certain look when entering stunt races. 16 Stunt Races have been added to GTA Online and are available from Rank 1 and after completing or skipping the GTA Online Tutorial. Stunt Races feature a mixture of exciting new props and vehicles. 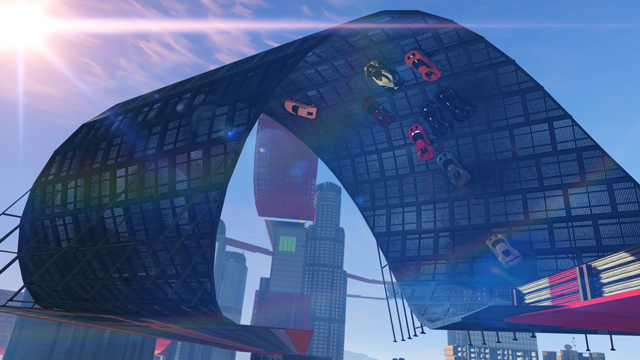 Players can join a Stunt Race through one of the 15 new Stunt Series blips in GTA Online Freemode. Stunt Series triggers allow players to join the current Race in the series and then cycle through all the latest Stunt Races. Players can join directly via one of the triggers or go on call to remain in Freemode while the lobby fills up. They can also use the Stunt Series option in the Quick Job phone app to join any open Stunt Race in the series. If a player wants to play a particular Stunt Race, the Race can be joined or hosted by selecting it from the Pause Menu Job List. Premium Races have been added to GTA Online and are available from Rank 1 after completing or skipping the GTA Online Tutorial. Premium Races are 8 player, high stakes, winner takes all, with predefined settings that cannot be altered. It costs $20,000 to enter a Premium Race and the player must own a personal vehicle that qualifies the class or model restriction of the active Race. This is detailed on the Premium Race trigger or blip on the map. Premium Races can be joined via the yellow Premium Race triggers in GTA Online Freemode or through the Active Premium Race option in the Quick Job phone app. An Adversary Mode trigger, blip and Quick Job phone app have been added to GTA Online Freemode. These either take the player into a currently promoted Adversary Mode or if there is nothing currently promoted, any active Adversary Mode. Over 180 new clothing items are now available from Clothing Stores for Male and Female characters in GTA Online. 50 new tattoos are now available from Tattoo Parlors in GTA Online. “Style” and “Vehicles” sub-menus have been added to help condense the Personal Interaction Menu. The “Racing Outfit” option has been added so players can choose an outfit to wear during Stunt Races. Players can set any saved outfit as their Racing Outfit. The “Bike Helmet” option has been added so players can choose a default helmet to wear on Motorcycles in Freemode and in Races. Turn “Auto Show Bike Helmet” option to on to apply the helmet automatically when getting on a Motorcycle in Freemode. The “Helmet Visor” option has been added so players can choose to have their Helmet visor up or down by default. Players can also open or close their helmet visors when on foot or on a bike. Hold dpad right when wearing a helmet with a visor to toggle the visor up or down. A “Fast Zoom” button has been added to the Rockstar Creator. Websites now indicate which vehicles are Pegasus vehicles. The MTL Brickade now is delivered with bulletproof tires when ordered from Pegasus. This also affects all previously purchased MTL Brickades. Fixed an issue that caused pickup icons to be visible for recorded Rockstar Editor clips made during the Adversary Mode – Power Play. These will no longer be visible in future clips. Fixed an issue that may have caused bullet decals on vehicles to not render correctly when previewing a clip in the Rockstar Editor. Fixed an issue that resulted in parachutes being available for placement in the GTA Race Creator. Fixed an issue that resulted in “Team Start Point” requirements to not adjust to the max number of players set in “Deathmatch Details” section. Fixed an issue that resulted in the camera to get stuck facing down when trying to place a prop in the Creator. Fixed an issue that resulted in players to get stuck in the Creator “Test Mode” after dying by falling from a large height. Fixed an issue that caused the “Medium Bush” prop in the Creator to sink into the ground. Fixed multiple crashes in GTA Online Freemode. Fixed an issue that caused the game to crash when a large number of players in a GTA Online session attempted to vault a wall at the same time. Fixed a crash that occurred when attempting to launch the Adversary Mode -Trading Places. Fixed an issue that caused the side windows of a modified Imponte Phoenix to disappear when entering a garage property. Fixed an issue that caused an invalid time to appear for the “Average Time per Session” statistic on the Pause Menu. Fixed an issue that may have caused enemy Helicopters in GTA Online to behave erratically or not leave their initial spawn point. Fixed an issue that displayed an incorrect description for the Tug boat on the DockTease website. Fixed an issue that resulted in players being unable to save an outfit after playing the Adversary Mode – Drop Zone. Fixed an issue that resulted in the gender of your Personal Assistant to not change after selecting the opposite gender during an Office trade in. Fixed an issue that resulted in players to get stuck facing their Apartment when loading into GTA Online. Fixed an issue that cause players’ Yachts to move position after changing session. Fixed an issue that caused the Sovereign Motorcycle wheel color to not remain after having already made the purchase. Fixed issues that caused frame rate stuttering when changing accessories or outfits in the Personal Interaction Menu. Fixed an issue that resulted in players seeing a 400 hour cooldown timer for the VIP Works – Piracy Prevention & Sightseer. Fixed multiple issues with the VIP Buzzard spawns. Fixed an issue where players would get stuck when attempting to leave the Executive Office desk chair. Fixed an issue that caused the blip that signals when the Target has been picked up by their Bodyguards to no longer appear in the Adversary Mode – Extraction. Fixed an issue that resulted in multiple players to display as “undefined” in the dpad leaderboard after multiple drivers left a GTA Race. Fixed an issue that resulted in “undefined” to appear on the taxi meter after selecting a friend’s Apartment or Office while playing in Asian languages. Fixed an issue that resulted in players being charged incorrectly for using the “Request Luxury Helicopter” service from the Personal Assistant. Fixed an issue that caused players to be reverted back to the Friends Menu after trying to join an in-progress Vehicle Deathmatch while testing a Race in the Creator. Fixed an issue that resulted in players being unable to scroll through the “Masks” section of the Personal Interaction Menu correctly. Fixed an issue that resulted in players to lose functionality after purchasing several weapons from Ammu-Nation. Fixed an issue that resulted in players to be stuck in the sky after joining an in-progress playlist of various Adversary Modes. Fixed an issue that resulted in players to get stuck in the sky after voting for a job on the Next Job Voting Screen. Fixed an issue that caused the SecuroServ computer in the Office to not be useable. Fixed an issue that resulted in all players in session to be able to hear each other despite having their voice chat setting set to “Organization”. Fixed an issue that resulted in targets warping under the map during the VIP Work – Headhunter. Fixed an issue that resulted in the “Suped Up” award to not progress if the “No Roof” mod is applied to the Pfister 811. Fixed an issue that resulted in players receiving a phone call from their Personal Assistant saying that a Special Item was available, but when the player accessed the SecuroServ Network they were not offered a Special Item. Fixed an issue that resulted in players to fall through the world after joining a new session from another player’s Office. Fixed an issue that resulted in players’ Associate wages to reset back to $5,000 after completing the VIP Challenge – Salvage. Fixed an issue that resulted in Associates to stop receiving regular SecuroServ payments. Fixed issues that caused multiple power-ups in the Adversary Mode – Power Play to persist indefinitely during the match. Fixed an issue in the Adversary Mode – Power Play where power-up audio would not play if the match is in Sudden Death. Fixed an issue where spectators would not receive any music during the Adversary Mode – Power Play. Fixed an issue in the Adversary Mode – Power Play where spectators would not receive any objective text. Fixed an issue that resulted in clipping issues with the “Shades” team outfit in the Adversary Mode – Power Play. Fixed an issue where camera controls were not flipped under some circumstances when activating the “Flipped” power-up during the Adversary Mode – Power Play. Fixed an issue that resulted in the “Zoned” Power up blip to not appear on the radar when at a significant distance during the Adversary Mode – Power Play. Fixed an issue that caused players to spawn in an out of bounds location during the Adversary Mode – Power Play. Fixed an issue that caused Machine Pistol ammo to not persist between sessions if the player owned no other SMGs or only owned LMGs as other SMG weapons. Fixed an issue that resulted in players to lose all their Musket Ammo after transitioning from GTA Online to Story Mode then back to GTA Online. Fixed an issue that caused all players in a lobby to be stuck launching if a player quit before the second job began, another player joined and all players idled before launching. Fixed an issue that resulted in CEOs being unable to invite players to be their Associates. Fixed an issue where players would be stuck in the on a black screen after choosing to fast travel to their owned Warehouse in the Luxury Helicopter. Fixed an issue that resulted in players to be stuck on a black screen after selecting to fast travel to their owned Warehouse. Fixed an issue that resulted in job blips to be suppressed for players who are not participating in a VIP Work whilst a VIP Work is active in session. Fixed an issue with the laptop in some Warehouses where players would lose functionality when using it. Fixed an issue that resulted in some Special Item crates to appear in the Warehouse correctly for the Associate who delivered it but not for the Warehouse owning CEO. Fixed an issue that caused players to not be taken inside the Warehouse upon delivering 3 crates at the same time by landing in the drop off area in Buzzard. Fixed an issue that resulted in players to get stuck on a black screen after delivering multiple crates to the Warehouse while an Organization member is a significant distance away. Fixed an issue that caused players to be stuck on a black screen if they killed themselves while delivering Special Cargo to a Warehouse. Fixed an issue that resulted in players being told the incorrect amount of Special Cargo after successfully delivering it to the Warehouse. Fixed an issue that resulted in players being told they had delivered one crate, despite two players having delivered two at the same time. Fixed an issue that caused players to get stuck on a black screen after passing out from drinking inside their owned Yacht. Fixed an issue that meant players couldn’t exit their garages while someone is trying to buzz in. Fixed an issue that resulted in font changes to not be applied when trading your Office in. Fixed an issue that caused players to be stuck in the sky if all players DNF during a parachuting job. Fixed an issue that resulted in the Online Tutorial Last Team Standing – Cypress Flats to not properly begin. Fixed an issue that caused physics issues when carrying a container with a Cargobob Helicopter containing several players. Fixed an issue that caused incorrect trajectories for thrown projectiles in some circumstances when thrown from vehicles in First Person. Fixed an issue that allowed the First Person camera to clip into the player’s body when sitting down in an Office property. Fixed an issue where a player’s camera could intersect with the driver of a Tug boat. Fixed an issue that caused the First Person camera of the Nagasaki Hot Rod Blazer to clip through the player when performing certain jumps. Fixed an issue that caused a player’s head to be facing in the wrong direction when in the back seat of a Helicopter. Fixed an issue that caused the pointing animation to play incorrectly on a player when they are holding a two-handed weapon. Fixed an issue that caused players to be positioned incorrectly when sitting in the chairs of an Office property. Fixed an issue with players clipping through vehicle doors when multiple players tried to exit a vehicle at the same time. Fixed an issue that may have caused loss of control when a player crashed their vehicle while performing a drive-by with the Heavy Revolver weapon. Fixed an issue that would cause buildups of traffic outside the Arcadius Office property when multiple players were inside. Fixed an issue where players would try to smash a vehicle window to perform a drive-by when the door was fully open. Fixed an issue with out of sync animations when viewing a player performing a drive-by on the back of a Motorcycle. Fixed an issue with interior maps rendering incorrectly on the radar map when moving between floors of a building. Fixed an issue with an incorrect vehicle manufacturer displaying for the MTL Brickade. Fixed spawning issues in the golf course variant of the Freemode Event – Hold The Wheel. Fixed an issue that resulted in players who were sitting at the Office boardroom table to not look at the Boss. Fixed an issue that was causing some players to clip into one another while sitting on the couch in the Office. Fixed an issue that resulted in players who were invited to another player’s Office to not see the name of the Organization displayed above the Personal Assistant’s desk. Fixed an issue that resulted in the armor pick-up to not be collectible for the previous rounds winners in the Adversary Mode – Trading Places. Fixed clipping issues with the “Babydoll Floral Dress” when sitting in an Office chair. Fixed an issue that resulted in the message “Player has registered as a VIP” to appear for players when they had actually registered as a CEO. Fixed an issue that caused certain Warehouse options to still be selectable in the Quick Travel menu despite the player being already close to it. Fixed an issue that resulted in players’ requested personal vehicles to be placed on the Office helipad. Fixed an issue that resulted in the Benefactor XLS (armored) to still cost a player $5000 to call in from the CEO Vehicles menu, despite the player already owning the vehicle. Fixed an issue that resulted in some Special Item Buy Special Cargo Missions being easier than intended. Fixed an issue that caused the Office blip to not return after hiding them in the “Hide Options” in the Personal Interaction Menu. Fixed an issue that caused hats from previously worn Associate outfit styles to appear in a newly set style if changed inside a vehicle. Fixed an issue that resulted in players’ impounded vehicles to remain impounded when using the Personal Assistant for the recovery service. Fixed an issue that meant purchasing a Shark Card during an in-progress order Office order would restart the Office order. Fixed an issue that resulted in newly created characters to have their crew’s t-shirt equipped rather than what is chosen in the Character Creator, if previous character used was wearing a VIP outfit style. Fixed an issue that caused the Associates of a CEO to remain in their CEO’s Office despite their CEO leaving the Organization to join another. Fixed an issue that resulted in players’ personal vehicles to never arrive correctly when being ordered to the West Vinewood Backlot Warehouse. Fixed an issue that resulted in the Mechanic to not get added to players’ contact lists after purchasing a Pegassi Reaper then switching sessions. Fixed an issue that resulted in no help text to appear for tips about changing your Office Decor. Fixed an issue that meant players would not receive the alert telling them they were going to save money when trading in a Warehouse for a cheaper option. Fixed an issue that caused the “Hide Options” for VIP / CEO work to not work correctly. Fixed an issue that resulted in players spawning into their Office without an interior. Fixed multiple collision issues with the Executive Office desk chair. Fixed an issue that resulted in players receiving phone calls from a female Personal Assistant despite having an Office with a male Personal Assistant. Fixed an issue that resulted in Associate players hearing safe install dialogue from the Personal Assistant during their CEO’s Office intro. Fixed an issue where female players would clip noticeably through the back of the Executive Office desk chair. Fixed an issue in Don’t Cross the Line where players’ lines would be break if they moved left immediately as soon as the starting countdown finished. Fixed an issue that resulted in players being unable to get up from the sofa in the Office after sitting down once other players had started playing Don’t Cross The Line. Fixed an issue that resulted in button conflicts between the “Start Recording” / “Turn on Action Replay” functions and Don’t Cross The Line. Fixed an issue that caused only one avatar / gamertag to appear during Don’t Cross The Line when playing with 4 players. Fixed an issue that caused the 4th player behind the couch to not animate as intended when playing Don’t Cross the Line. Fixed an issue that resulted in the 4th player standing beside the couch to be unable to join Don’t Cross The Line. Fixed multiple Don’t Cross The Line help text issues. Fixed an issue in Don’t Cross the Line where players would not be taken into the mini-game if they were in first person. Fixed an issue that resulted in players receiving Don’t Cross The Line help text telling them they can now play Don’t Cross The Line as there is enough players, despite the other players watching TV. Fixed an issue that resulted in players to be stuck in a sitting down animation when two players attempt to leave Don’t Cross The Line as a 3rd player sits down and launches the game. Fixed an issue in Don’t Cross The Line where if one of the three players on the sofa is watching TV, other players are told to sit on the sofa to play Don’t Cross The Line, which is not possible. Fixed an issue that resulted in players who were already in position with enough players to receive the prompt “Wait for another player to play Don’t Cross The Line”. Fixed an issue that caused players to be seen standing on the sofa after quitting out of Don’t Cross the Line then quickly pressing O / B to stand up from the sofa. Fixed an issue that resulted in the 4th player to fall through the world after pressing the exit button while in player list for Don’t Cross The Line. Fixed issues with players’ lines moving sideways and out of sync during Don’t Cross The Line. Fixed an issue that caused players to constantly keep performing the idle chair animation during Don’t Cross The Line. Fixed an issue that resulted in players receiving help text to “Sit down to play Don’t Cross The Line” despite already being sat down on the sofa. Fixed an issue where the “Request Luxury Helicopter” option would not be available if the player is not CEO but owns a Warehouse. Fixed an issue that resulted in players to become stuck entering their Office when trying to enter after completing a Buy Special Cargo Mission. Fixed an issue that caused players to be spawned in as invisible after spectating a player that is completing a Buy Special Cargo Mission. Fixed an issue in multiple Sell Special Cargo Missions where players would not be told to “Lose the Cops” while waiting for another member to lose the cops at the end of the Mission. Fixed an issue that caused Special Cargo crates to fall through the map meaning they could not be collected and the Mission could not be completed. Fixed an issue that caused targets to fall inside inaccessible buildings after destroying their Helicopter during Buy Special Cargo Missions. Fixed an issue that may have made Special Cargo packages unreachable if dropped on a Yacht. Fixed an issue that meant tapping X / A to run would cancel the Personal Assistant’s phone call from coming through and delay the beginning of some Special Cargo Missions. Fixed sound effects issues with some Sell Special Cargo Missions. Fixed an issue that meant own Organization players were able to lock onto Buy / Sell / Defend Special Cargo Mission vehicles. Fixed an issue that caused players’ Office Special Cargo items to appear in other players’ Offices. Fixed an issue that caused a significant delay before the player was removed from the Executive Office desk chair after launching a Buy Special Cargo Mission. Fixed an issue that meant players were unable to complete the Sell Special Cargo Mission that ends at the Lake Vinewood drop off due to the size of the drop off. Fixed an issue that resulted in players being unable to enter their Office after ordering Cargobob Jetsam from the Personal Assistant, picking up a car then landing on the Office helipad. Fixed an issue that resulted in the VIP Work – Headhunter to not be hidden for Non-Organization players despite the player setting their VIP / CEO Work set to “Hide”. Fixed an issue that resulted in players’ gamertags to be displayed multiple times on some end of round leaderboards. Fixed an issue that resulted in a broken transition when entering Online from Story Mode. Fixed an issue that resulted in hat or accessory previews on players’ characters to not change when scrolling through the options in the Personal Interaction Menu. Fixed an issue that resulted in the help text that advises Associates that they can’t use the Executive Office desk chair or the head of the boardroom table to constantly flicker. Fixed an issue that resulted in players to get kicked out of a different Apartment when attempting to enter their own on foot. Fixed an issue that resulted in the Luxury Helicopter to constantly stay in the air and never land. Fixed an issue that resulted in the “Quick Travel to Office” Luxury Helicopter option to no longer function. Fixed an issue that resulted in players to spawn into their Apartment and constantly fall through the world after quitting from the “All In Order” Heist alert screen. Fixed an issue that resulted in the “All in Order” challenge progress to be reset after only completing some of the Heist Set-Up Missions. Fixed an issue that resulted in the prompt that advises players that they have the ability to hide blips to persist after completing several Heist Missions. Fixed an issue that resulted in the Heist “H” blip to constantly flicker when inside the Apartment. Fixed an issue that resulted in the Heist “H” blip to not appear in some high end Apartments. Fixed an issue that resulted in players being unable to pick up the trash bags in the Heist Series A Funding – Trash Truck. Fixed an issue that resulted in the Heist Series A – Finale to not correctly launch as expected. Fixed an issue in the Heist Humane Labs – Key Codes where players were unable to complete the Heist after exiting and entering vehicle as it was being is driven into the Apartment. Fixed an issue that resulted in players being unable to complete the Heist – Pacific Standard Finale if a player is killed right before the bank entry cutscene. Fixed an issue that resulted in players to not receive the prompt to put their mask on during the Heist – Fleeca Job Finale. Fixed an issue that resulted in players to not receive any help text to explain the gun locker or the safe after renovating their Office. Fixed an issue that resulted in players not receiving any Personal Assistant dialogue. Fixed an issue that caused the Executive Office desk chair to pop out of place for other players in the Office when the CEO player tried to sit down. Fixed an issue that resulted in the menu for the lift to appear when walking close to the lift but disappear while the player is scrolling through it. Fixed an issue that caused the Executive Office desk chair to sit at an offset position if the player left their character sitting in the chair for a significant amount of time. Fixed an issue that resulted in players seeing other players leaving the Office by the roof / ground with them, despite the other players having selected the opposite option. Fixed an issue that resulted in players appearing in the Office exit animations despite them exiting the Office in a different way. Fixed an issue that resulted in players not being sent to their chosen location when exiting the Office when the owner uses the opposite “All exit” option. Fixed an issue that caused a white line to be visible amongst the score bars for spectators during the Adversary Mode – Trading Places. Fixed an issue that caused phone contact invites to make the accepting player the host of the job, instead of attempting to join other players first. Fixed an issue that resulted in the feed message text “Available from Legendary Motorsport” to be very difficult to read. Fixed an issue that resulted in players getting stuck in the sky when attempting to launch “Shooting Range” challenge during Flight School. Fixed an issue that resulted in clipping issues with other players when all players stand up from the couch in the Office at the same time. Fixed an issue that resulted in players to not have the option to show / hide Proximity Mines in the Gun Locker menu in the Office, despite owning them. Fixed clothing clipping issues with the chairs in front of the Executive Office desk. Fixed player clipping issues with the Office sofa. Fixed an issue that caused the tucked variant of a shirt to remain unavailable after purchasing the untucked version. Fixed an issue that caused the “Cash” and “Body Armor” options in the Personal Interaction menu to be greyed out when not accessible. Fixed an issue that caused clipping issues when performing actions with specific helmets / hats. Fixed clipping issues with the “Independence Tailcoat” and the “Muscle Pants”. Fixed an issue that resulted in players receiving the message “CHALLENGE OVER” after letting the time expire during the VIP Challenge – Salvage. Fixed an issue that resulted in players receiving incorrect help text after entering a player’s Office when holding the briefcase during the Freemode Event – Hot Property. Fixed an issue that caused players to receive a screen reading “Purchase pending…” for several seconds after returning to the Docktease website after visiting the PS store. Fixed an issue where players would become stuck in the sky after experiencing a service outage at the end of the Adversary Mode – Trading Places. Fixed an issue where players would become stuck on a black screen after accepting an invite into a friend’s User Generated Content job after changing their “See and Share Content” setting from “Blocked” to “Friends” when invited back into the same job. Fixed an issue that resulted in restricted players being able to see the names of Offices and Warehouses on the map after joining an Organization, despite the CEO of the Organization having their “See and Share Content” set to “Blocked”. Fixed an issue that resulted in the Cheval Marshall to disappear from the Pegasus menu upon on exiting GTA Online. Fixed an issue that caused players’ Transaction Logs to appear empty on the Maze Bank website. Fixed an issue that caused incorrect aim centering when controlling a Helicopter with a mouse while a gamepad was plugged into the system. Fixed an issue when running with AMD Eyefinity or NVIDIA Surround that caused the mouse cursor to render on the wrong screen when the Pause Menu was open. Fixed an issue that could cause the Rockstar Editor to crash when attempting to export with low hard drive space. Fixed an issue that resulted in the “Stock” tires from Benny’s to consistently revert to whatever special tires were previously equipped, after reloading the game.